Wanjiku Wa Ngugi is a daughter of Ngugi Wa Thiong’o who is yet again being tipped as a frontrunner for the Nobel Prize for literature. She showed that she too could get published when she unleashed to the unsuspecting public a book called The Fall of Saints. It is a whodunit type of book which has gotten mixed reviews on Goodreads. Readers in the German language now have an opportunity to have their own mixed reviews of her book as it is now in their native language. 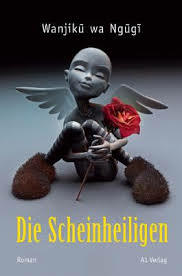 The boon with the title Die Scheinheiligen is now available in German on Amazon. This will be welcome news in Lamu town which as y’all know has quite a sizable German minority.